So many new items to share with you all! First, The Epiphany has opened and it is full of amazing gacha creations. Today, I am featuring the new Animesh baby dragons and hatchlings from Hextraordinary. You must have an animesh enabled viewer to see these!!! They are adorable and animated. A couple things to keep in mind are that Animesh, when rezzed, has a higher land impact than regular mesh and you can only attach one animesh item to your avatar. This set is available at The Epiphany. The skybox is by Milk Motion. 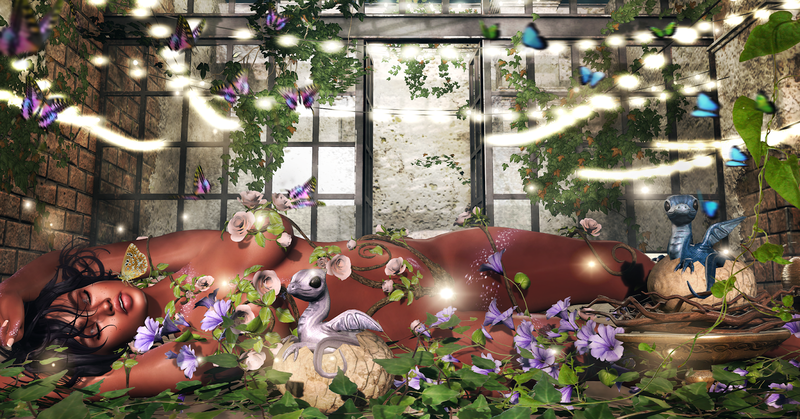 It comes with the awesome ivy and string lights as well as a version of the skybox with rain!! This can be purchased at Collabor88. The hair I am wearing is discontinued. Sorry everyone. It is by Argrace. Maybe they will update this style with their new textures in the future. Enjoy this post!